I also compiled several different resources onto this blog post from earlier in the month. How coincidental that today I was plugging away at teaching nonfiction summarizing with my reading class. Earlier this week, we practiced using the article "How Do We See in the Dark?" and sorting ideas as more important or less important. Then, students worked to write a summary of the text, using the important ideas as a guide. (Write to me if you'd like a copy of this text and I'll send it your way.) It worked well and helped the students to write decent summaries of that text. When we were talking about how to figure out which ideas were important, one kid blurted out, "Just look at the headings!" Perfect! Soon, I'll be assessing their summarizing skills. Next year, I'll make sure that I don't leave this assessment until the very end of the year! Here is a blog post that I wrote a few years ago on creating summarizing assessments. For formative assessments, it makes a lot of sense to use a summary rubric. However, for a final look at summarizing skill, especially for younger students, using a checklist approach makes for quick and easy scoring. Simply make a list of the important ideas from the text. (This is fun to do with colleagues!) Then, check off the ideas that students include in their summaries. Set a score for what you are looking for--4/8 important ideas? 6/8? Again, it's useful to do this with colleagues. Hopefully things will go well for my readers. It's hard to think about ending the year--I'll miss this group! Sadly, the year always ends in such a blur of assessments and scores that I don't always have a chance to sit back and appreciate the progress that we've made. I haven't been able to post much lately...I am consumed with end of year spreadsheets! One file for class lists for our outgoing fourth graders, another for our incoming fourth graders, reading data, oral reading fluency scores, field trip groups, science, social studies, and math grades. In my spare time I am relaxing by making a vocabulary list in which I have collected words from the Academic Word List, the Common Core, the Fry List, and a few other sources. I am cataloging these words by phonograms, spelling patterns, multiple meanings, word roots, and so forth...hopefully I will end up with a list of 1,500+ words that will be the basis for really good spelling/vocabulary lists for my students. I've finished the bulk of the words and am now working on the variants and making everything consistent through the list. So, if you don't hear from me again by July, it means that the spreadsheets will have won and I will have either a) given up technology and gone to live in the woods, or b) been sucked permanently into the computer. 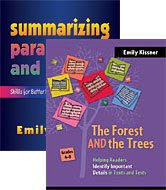 It's been six years since Summarizing, Paraphrasing, and Retelling was published. I'd like to say that the story ended happily ever after with everyone summarizing perfectly every year. But that's not the way things work with real children, is it? (And wouldn't it be boring if things worked out that way? I don't think I could possibly teach the same thing year after year.) In the six years since Summarizing, Paraphrasing, and Retelling, I've created new lessons and new tools for teaching summarizing...and I've put many of them online to share. The rubric below is a six-point rubric that I created this year. My goal was to create something that would reflect the transformational nature of skilled summarizing. One time effective way to help students write a summary is to model the process of distinguishing between important ideas and less important ideas. This model lesson and text guides you through the process of doing this with students. This presentation explains the process of writing a summary for students.